Although women's team sports don't normally get huge publicity in the hobby, much of the world watched the 2015 FIFA Women's World Cup in Canada. The 24-team tournament featured big performances and several upsets along the way. In the end, the United States notched their first World Cup title since 1999 and became the first country to reach three titles in Women's World Cup history. The following guide looks at the top overall stars to collect from the tournament. Unfortunately for women's soccer collectors, there is not a huge overall supply of cards for the sport, especially for the teams outside of North America. The 2015 Panini Women's World Cup Stickers set features a detailed look at each team in the tournament and is a great place to start for basic collecting. The budget pricing also makes it relatively affordable, although chasing the full set can get costly. The list below looks at the top players with more-traditional soccer cards. This does exclude some of the bigger global names, like Celia Sasic (Germany) or Amandine Henry (France), simply because there is not much to collect. Homare Sawa, the long-time star of Japanese soccer, does have several releases from her native country, including autographs, but they can be tougher to locate. Other top Japanese players, like Aya Miyama, have similar cards. In addition to those covered, there are still many other women's players worth collecting. One particularly intriguing name is Sydney Leroux. The Canadian-born striker plays for the United States and is one of the more dynamic athletes in the sport. She is also married to Dom Dwyer, the English striker for Sporting Kansas City. However, Leroux still has not seen consistent minutes on the stacked U.S. roster. Those who are interested in more women's soccer choices should check out players from the National Women's Soccer League (NWSL) or Women's Professional Soccer (WPS), as they generally have the most cardboard options. Also, major card companies tend to feature top players following the World Cup, so multiple products should contain standouts from the 2015 Women's World Cup during the next year or so. Click on the name listings or images to shop for cards on eBay. Considered by many to be one of the best current players in the world, Carli Lloyd put a largely unimpressive group stage behind her and carried the United States to the title. Her six-goal tournament, all scored in the single-elimination portion of the World Cup, was capped off with a hat trick in the final match. Lloyd won the Golden Ball as the World Cup's best player. She also tied for the overall goal lead, earning her the Silver Boot on a tiebreaker with Celia Sasic. While her card options are not quite plentiful, collectors has several choices, including an autograph in 2014 Allen & Ginter. Given her incredible run in the World Cup, expect many more Carli Lloyd cards to be on the way. 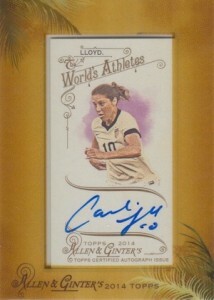 View the top ten cards for Carli Lloyd here. Arguably the top name in soccer over the last few years, Abby Wambach is virtually unmatched in terms of her scoring ability and accolades. Although her role was much less prevalent than in previous years, Wambach finally has her World Cup title in her last appearance on the sport's biggest stage. 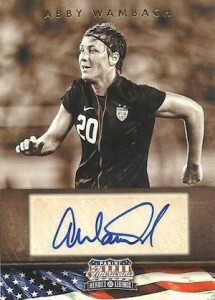 Given her long career and considerable success, Wambach is one of the most heavily covered options for collectors. One of the most technically skilled players in the World Cup, Megan Rapinoe made her biggest mark early in the tournament. Her two-goal performance helped the United States overcome a sluggish start to claim a 3-1 win over Australia. 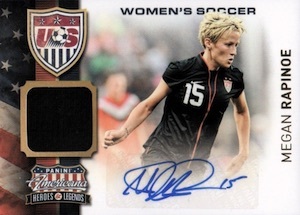 Rapinoe's card choices are mostly limited to one product, but she has several different cards in 2012 Americana Heroes and Legends. Injuries have somewhat slowed her ascent, but Alex Morgan is viewed by many as the future for American soccer. Her 2015 World Cup was not especially memorable, but she played hard when she saw the field and will be the clear face of the team in the next World Cup. Because of her popularity, expect card options for Alex Morgan to build rapidly in the future. Off-field issues have diminished her mainstream appeal, but Hope Solo remains one of the best goalies in the world and the most polarizing figure in the sport. Solo was named the Golden Glove winner as the top goalkeeper in the 2015 Women's World Cup. She also has the most card options of any player in the tournament, including quite a few autographs. Like the other Brazilian greats, Marta is a huge soccer star with strong recognition and one name. Brazil remains one of the best teams in the world and Marta is a huge reason for that. Although they made it out of the Group Stage undefeated, Brazil was upset by Australia in the Round of 16. 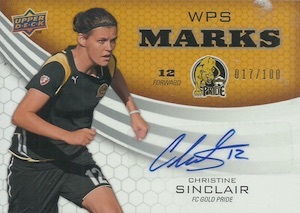 Marta's card market is more limited than the other names, but her time in the WPS league resulted in several cards. Another women's soccer heavyweight, Christine Sinclair is the greatest Canadian soccer player of all-time and received increased exposure as the top player for the home team. 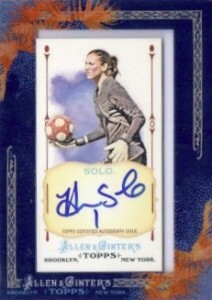 She also happens to play club soccer in the United States, which means there are multiple cards available from 2010 and 2011 products. Like Brazil, Canada was sent home early. Given her age, Sinclair is likely nearing the end of her career.